Regular followers will know that in between the beauty reviews I throw in the occasional Free From food. This week I discovered Easy Bean. If I remember correctly I first saw these at the Vitality Show but I had forgotten all about them, you see I shop at Tesco and these are stocked in Sainsburys & Waitrose. Easy Bean is a one pot meal so perfect for warming you up in the colder weather and convenient for work as they can be heated in the microwave. There are a variety of flavours to choose from - Moroccan Tagine, Mexican Chilli, Indian Sambaar, French Cuisinees, Spanish Punchero & African Palava. From what I can see they are all Gluten and Dairy free, some are suitable for Vegetarians others cater for Vegans and there are some meat choices. 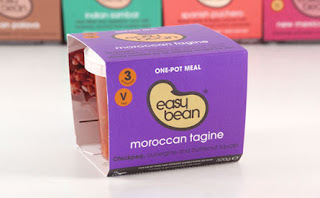 I picked up Moroccan Tagine which is "chickpea, aubergine and butternut squash with apricot infused with aromatic spices." This pot equals 3 portions of veg, high in fibre, low in fat, low in salt, gluten & dairy free and suitable for Vegetarians (not Vegan as it contains honey). So what did I think? It was very tasty. 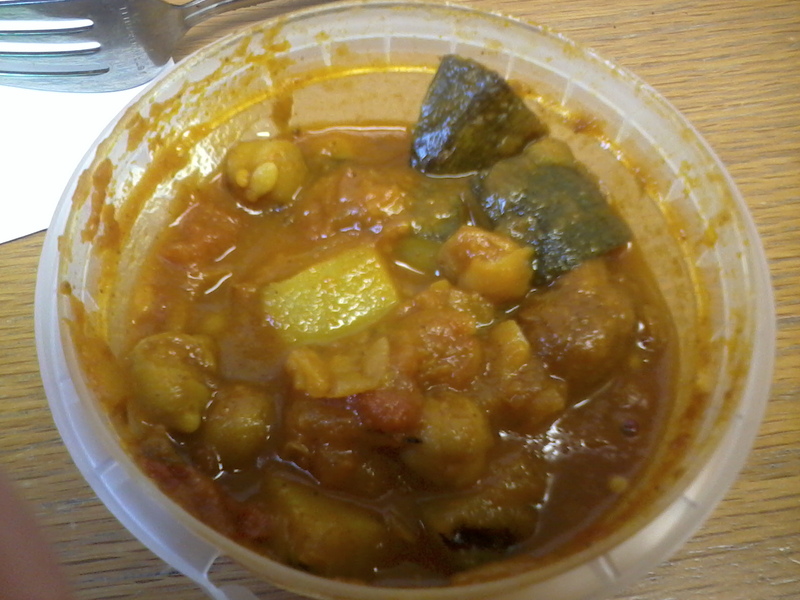 I particularly likes the big identifiable chunks of vegetables as sometimes ready meals are rather mushy. The pot size is 320g which was very filling. I paid £3.48 which is comparable to other similar meal pots. You would be correct in thinking that I get over excited when I find a dairy and egg free ready meal. Firstly, I get fed up of making my lunch everyday and I'd like a break from it once in a while. Secondly, every blooming Veggie meal out there is covered in cheese. Listen up food manufacturers Vegetarians don't exist on cheese alone do you think we are all calcium deficient? Lets have more Vegan options. Mr Tesco now you know why I detour to Sainsburys every once in a while, all of your own brand veggie meals are loaded up with CHEESE! Ok so rant over......Next time you are at the supermarket pick one of these up and give it a try. Let me know what you think.